There will be an all-Calderdale final in the West Riding Trophy after Ovenden West Riding beat highly-fancied Silsden White Star 2-0 at Woodlesford last night. 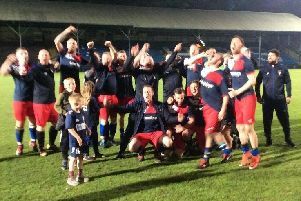 Halifax AFL side Sowerby Bridge had won the first semi-final and they will meet their local rivals on a return to the county FA’s headquarters on Thursday, May 3. Ovenden were good value for their victory with Silsden keeper Wayne Mahmoot making a string of outstanding saves to keep the score down. John Booth and Damian Randall were denied the most but both found the target before half time, Booth after a typical jinking run and Randall with a 25-yarder. Stan Stansfield, Silsden’s highly promising striker, was never given the opportunity to get his team back into the game in the second half. West Riding return to their pursuit of the County Amateur League Division One title on Saturday when they receive Overthorpe Sports & Social Club to West Vale (2-30).